Friends, I think you’re going to love this tour. It’s artistic yet accessible. Dreamy and yet utterly down-to-earth. 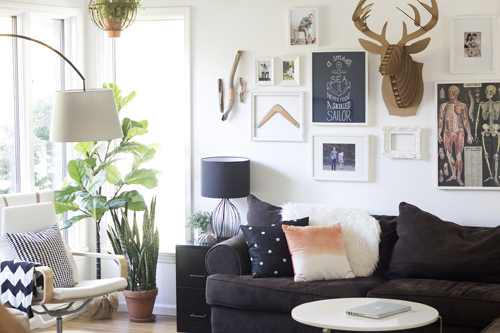 There are a lot of good ideas inside this house that don’t involve a ton of money. 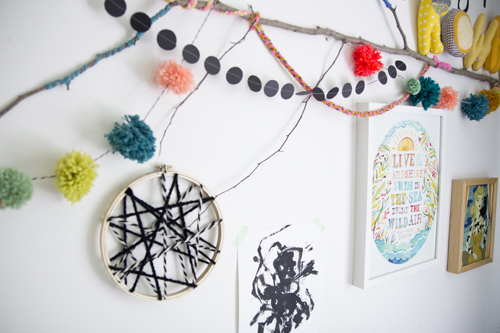 Do you have yarn and some found branches? 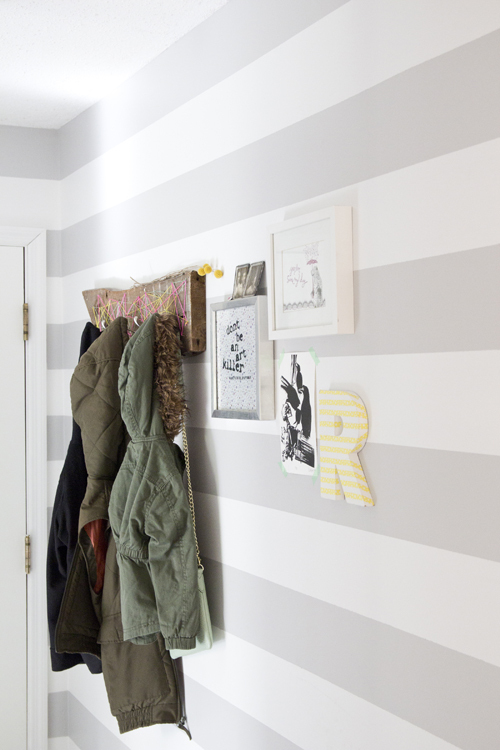 The courage to paint some walls an unexpected color? The bravery to withstand all the expert advice found in the aisles of your local home improvement store…and STILL believe your idea is the best? I think you do! I’m excited to introduce you to Jennifer Lula, maybe already known to you as the force behind Jen Loves Kev. She’s got all of the above and more. (And I mean it about the more: she let her husband name her blog! Now that is courageous!) Welcome Jen! Q: Tell us all about this happy little family! A: Hi everyone! So happy to get to share a little bit about us with you today. I am a former high school art teacher turned stay-at-home Mom. We have two beautiful little girls: Rowan Winter who just turned four, and Finley James who will be two this winter. My husband Kev owns his own web design company which he started four years ago this November. He’s the one that actually came up with my blog name, bought the domain, and built my first blog site for me as a surprise Valentine’s Day gift seven years ago. Time flies! We just celebrated eight years of marriage this year! We were the crazy kids that decided to get engaged, get married on a cruise, and move 6,000 miles away to Hawaii all within four weeks time. We lived our first year and a half of marriage on the island of Oahu before we eventually moved back to the Northeast to start careers and a family. We love family adventures and traveling. Our newest adventure was becoming a certified foster care family this past spring. We are excited at this opportunity to open our doors and love on these amazing children in the foster care system. 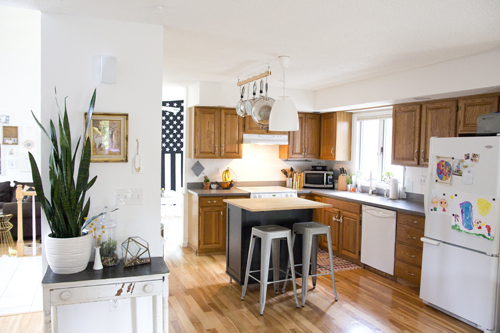 A: We had lived in a loft apartment for about three years prior to finding this house. When we started out on our house hunting journey, I asked my husband why every house felt like a cave? We weren’t having any luck. Nothing felt right. 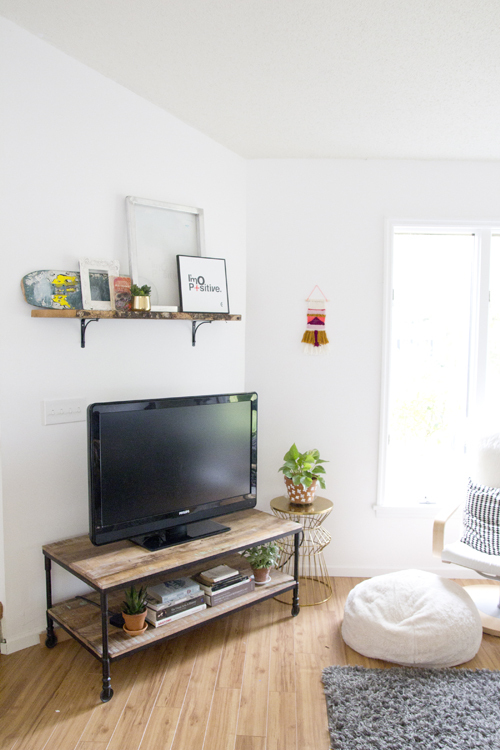 Finally one day we realized we were so used to living with the 15ft ceilings in our apartment, that all the houses we were looking at felt claustrophobic to us. When our realtor brought us into this house, I knew it was the one! The dining room/living room had a huge vaulted ceiling and so did the master bedroom. 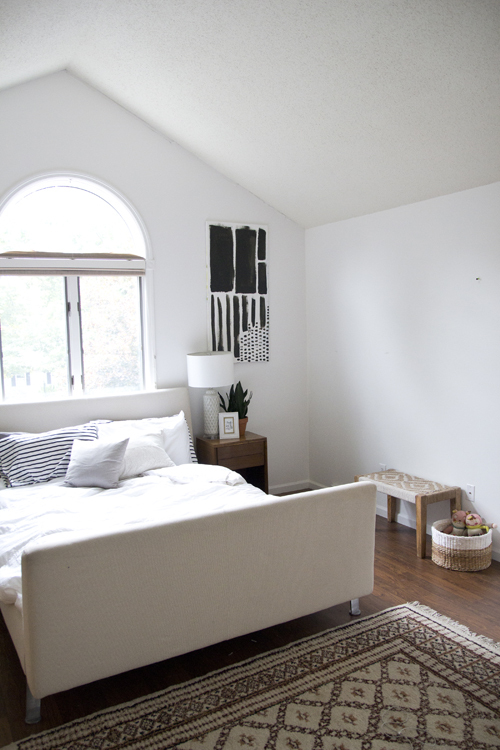 There was a ton of natural light making it feel bright and airy just like our loft. We were sold the moment we walked through the doors. Q: What makes you love where you live? A: We live in a quiet, quaint neighborhood. Lots of large trees and kids riding bikes. I love our little community! We live a little north of Albany, New York. It’s a great location because we are super close to the Adirondacks for lots of breathtaking hikes, but still an easy train ride or drive to NYC and our favorite city ever, Boston. I will admit I am not a fan of the winters here but the beauty that comes with Spring and Fall…ahhh it can’t be beat! It’s not the cheapest part of the country to live in but it’s definitely not big city prices, either. This is a good place to have access to the most beautiful mountains, some major cities, and the ocean. A: I’ve always been someone that’s loved knick knacks. Flea markets, thrift shops, and antique fairs are my candy store. My husband, on the other hand, loves a more modern, minimal style. If he had it his way, there would be a super modern couch in a white room with nothing else. 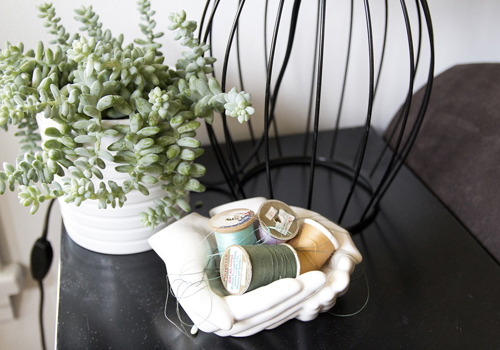 Over the years, I’ve learned to tame my hoarder like tendencies with found objects, and create a style that I think works for both of us. Having kids has helped that a lot, too. It’s just easier to keep it simple when you have small kids running around. 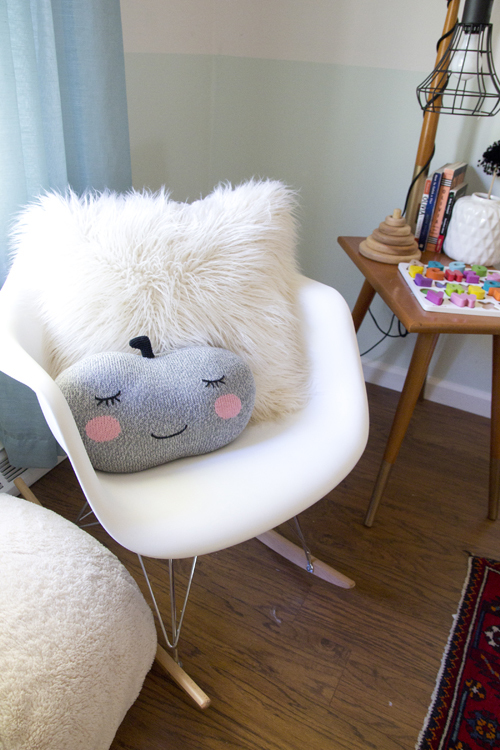 Q: You really are an artist; what’s your favorite thing you’ve ever made for your home? 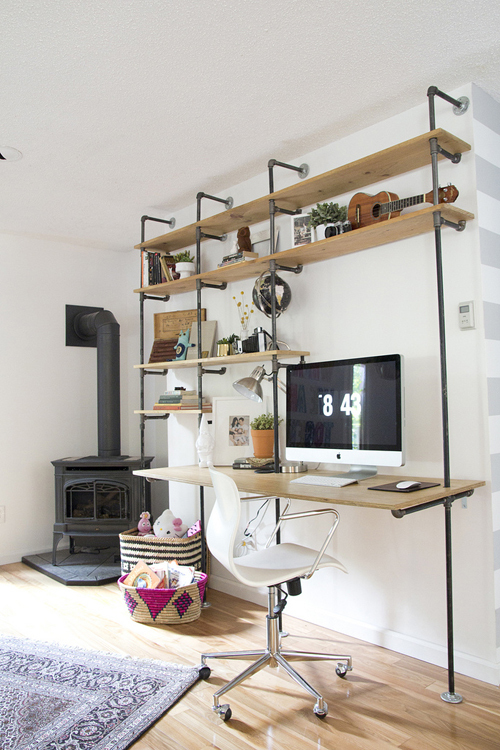 A: I love our desk/shelf unit with the plumbing pipes. I was nine months pregnant when I started that project. I think the whole “nesting thing” was really hitting me hard. I’m pretty sure everyone at Home Depot thought I was crazy. I was the super pregnant lady with a toddler, cutting, recutting (I screwed up a lot) and threading pipes everyday for, like, two weeks. I had this chicken scratched diagram I would bring in. I always tried to explain what I was doing but the old men working didn’t really seem to get it. It was a lot of work, but I will always have fond memories attached to it. Q: How have your girls affected your aesthetic? Do you find yourself decorating for them and for your life together? A: It’s funny how having kids changes your aesthetic. For the better, for sure! I love decorating for our life together. 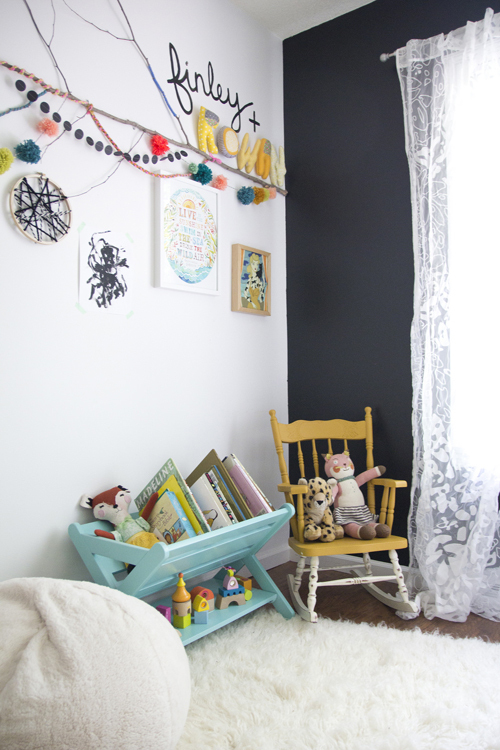 I never wanted to have any kind of space that was off limits, but also didn’t want everywhere to look like a kid’s play area either. Kid toys can get out of control fast! 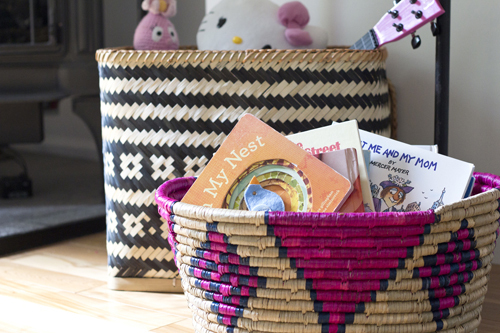 I love using decorative baskets or vintage dressers to hide toys in. They are still accessible but hidden at the same time. 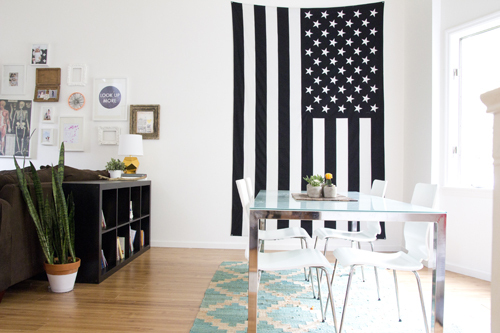 I like to keep things bright, fun, and simple when I decide what gets hung on walls or arranged on tables. 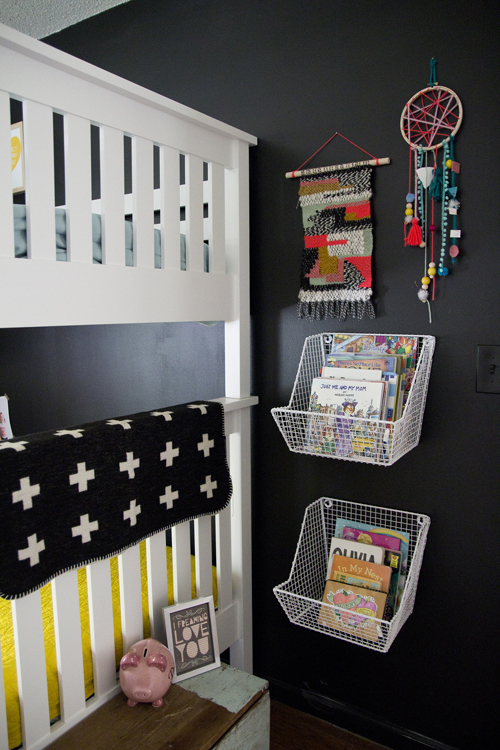 I also love to create special areas for them to read and draw. Q: You’re a blogger with an Etsy shop. How do you balance it all? What has each of your professional endeavors added to your personal life? How has your schedule affected how you parent? A: One thing I’ve realized over the past few years is that finding balance is a myth. For me, it just can’t be done. My main goal is keeping my priorities straight, and then things seem to fall into place after that. My faith, my husband, and my kids come first. If everything in those areas are taken care of and there is extra time, I will sit down and blog, or create necklaces for my Etsy shop. If there isn’t time, I just have to accept that and not feel guilty about not getting it all done. 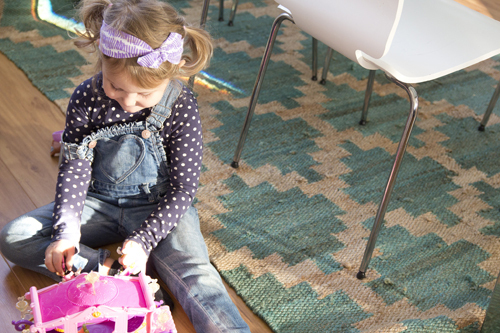 Having small children is a small (although it doesn’t feel small) season of life. I know one day they will be older and more self sufficient. I try to remember that when I am desperately trying to carve out sometime for myself. I love creating. It’s just part of who I am. So even a few minutes here and there are so enriching. I’ve also found I really enjoying bringing the kids in to be a part of that. I love going to museums with them, letting them be in photo shoots for the blog, or painting alongside me. Having a supportive husband is key, as well! Q: What do you really hope your girls remember about this home and their time in it? And what are you hoping they remember about the kind of mom you are to them? A: I really want them to remember all the love. I want them to look back and think it was a place that supported creative endeavors; a place where they were allowed to explore their passions and try new things. I also want them to remember lots of laughter. I try my hardest to be someone who shows respect and generosity to others. I really want them to learn to treat others with love. Including both their family and everyone around the world as well. I want them to have big hearts! Q: What has been the best part about living with your own kids? A: I love all the silliness that kids bring into your life. The wide-eyed curiosity they have. It’s such a joy to watch them experience all of life for the first time. A: …not to take any advice when I had my first baby. I know that sounds weird and I don’t mean it in a bad way or that I had all the answers. I was just so consumed by fear and guilt with my first baby that it was hard to really enjoy her. I read every book, asked everyone a thousand questions, searched baby sites, etc. – and found everyone did it so differently! There are a thousand ways to parent. Each and every day, we are faced with hundreds of questions. Breastfeed or formula? Cloth or disposable? 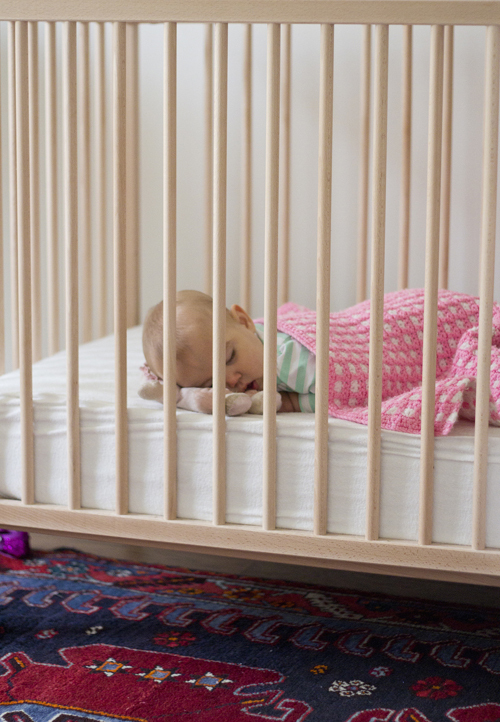 Co-sleeping or not? I felt like I was going to severely damage my daughter if I didn’t make the right decision, and of course everyone has an opinion they want to tell you about. It wasn’t working for me until I truly started building some confidence and trusting that whatever decision my husband and I made, it would be the right one for our family. Of course, you make wrong decisions from time to time…but it doesn’t break your baby! There is a time and place for seeking help. Just remember to trust your gut, ladies! You will know your family better than anyone else! For those of you who have blogs, what do you think about Kev naming his wife’s blog? Too cute, right? But it got me wondering what our partners would name our blogs if given that honor. Remind me to ask Ben Blair! P.S. – Are you interested in sharing your own home with us? Just send me a note! It’s a lot of fun…I promise! 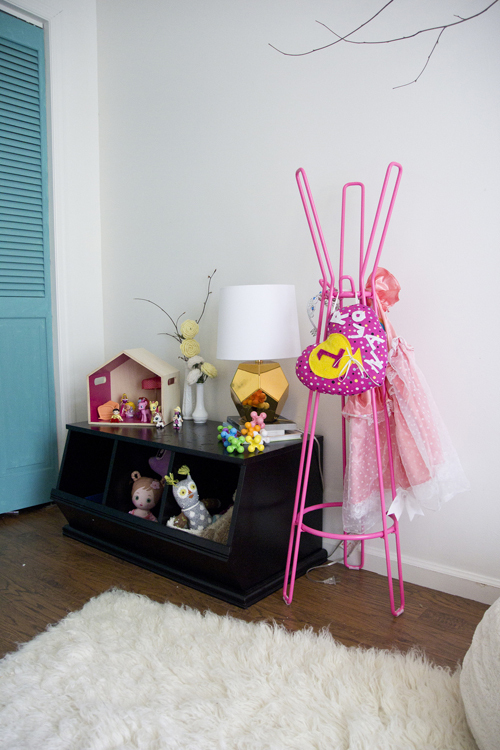 Take a peek at all the homes in my Living With Kids series here. 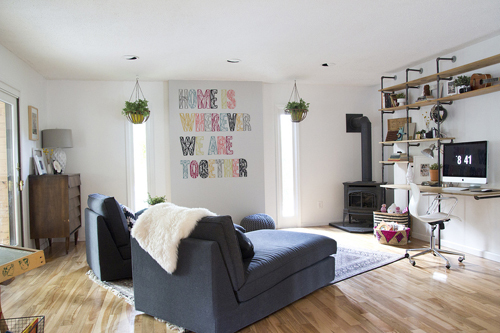 I’ve been reading Jen’s blog for about 4 years now, so it was an awesome surprise to see her home featured on Design Mom! I was like, “Hey! I know her!” Love her style! 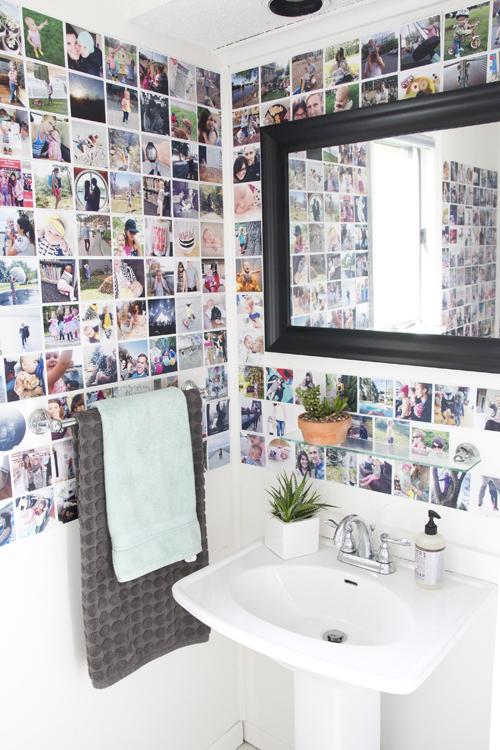 Love the bathroom “wallpaper” with all the family photos! Me, too! Me, too! How did you do that? Hi ladies! 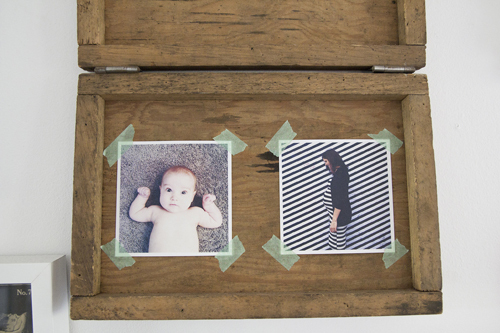 I just ordered square prints of our instagram photos from Social Print Studio (they have a great and easy app). They are great quality and not too expensive. Then I used permanent glue dots to stick them to the wall in a wallpaper type fashion. Every once in a while a picture needs a few extra glued dots to stay put but they’ve been up there for about a year now and only a handful have fallen. So whimsical! What a lovely place to be a family! I just love all the plants! 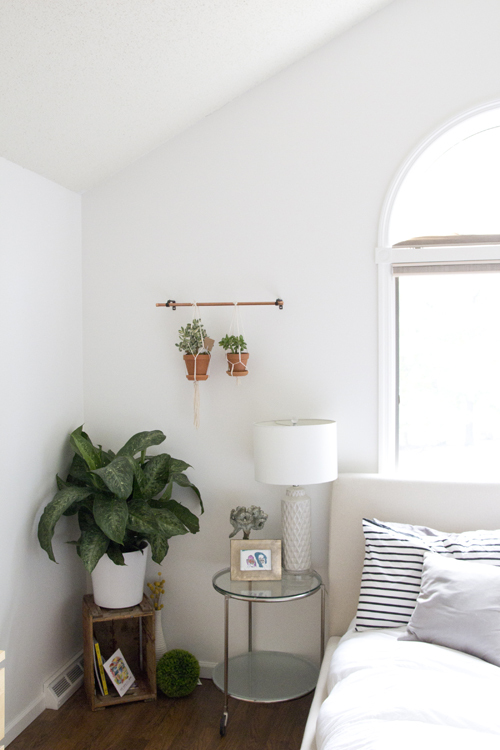 Plants are my favorite decorating element & add such warmth & coziness to a room. And that bathroom is wonderful, how did you do it? Is it wallpaper? And the silliness, I adore how silly my 3 girls can be & how they teach me everyday to lighten up & enjoy this life! Thank you for sharing your home! Hi Wendy! Thanks for the sweet comment. As far as the bathroom goes I just ordered square prints of our instagram photos from Social Print Studio (they have a great and easy app). They are great quality and not too expensive. Then I used permanent glue dots to stick them to the wall in a wallpaper type fashion. Every once in a while a picture needs a few extra glued dots to stay put but they’ve been up there for about a year now and only a handful have fallen. Oh the bathroom! I am in love with the photos in the bathroom! Yeah, tell us how did you do the bathroom? Wallpaper? Or just taping them all on the wall? I’m dying to know! Best decoration ever! 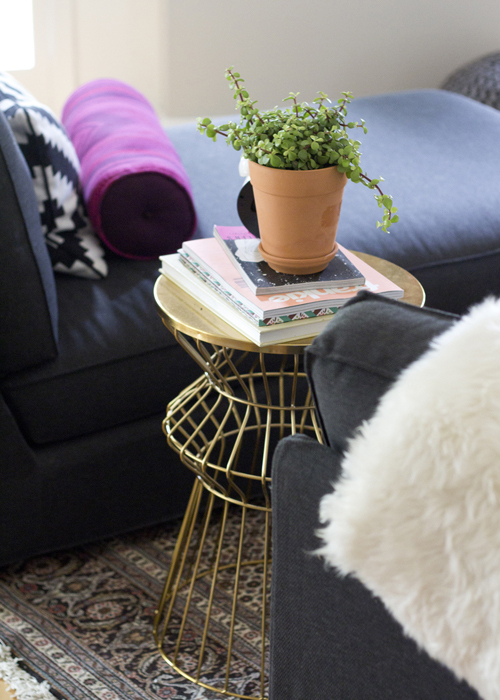 And your house….so “perfect” but homely….so cozy! If you look above in the comments I just replied to a few questions about the bathroom. It was really easy and pretty inexpensive. Hi TDW! I do try to feature a range of homes and families, though I realize not every tour will be relatable to every reader. But if you’re looking for working mothers that have a commute to an office, I hope you get a chance to look at the archives. There have been many featured — the first one that comes to mind is Anne McGraw. Ultimately, I can only feature home tours of people who reach out and are willing to share a piece of their life. If you know a family with an office-working mother that you would like to see featured, I encourage you to have them reach out to me. My email is at the bottom of the post. I am an officing mom and I remember there was a great home in Reno – the mom was a practicing attorney. I loved that house – and remember wondering how she kept it so beautiful! :) Check out that one for inspiration – it was great! I love your comment on priorities vs. balance. So true, yet so seldom realized! 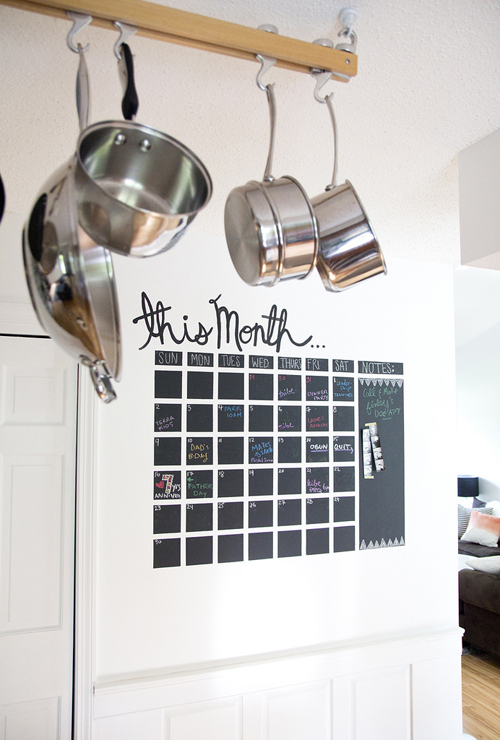 #1 Love the “this month” calendar. 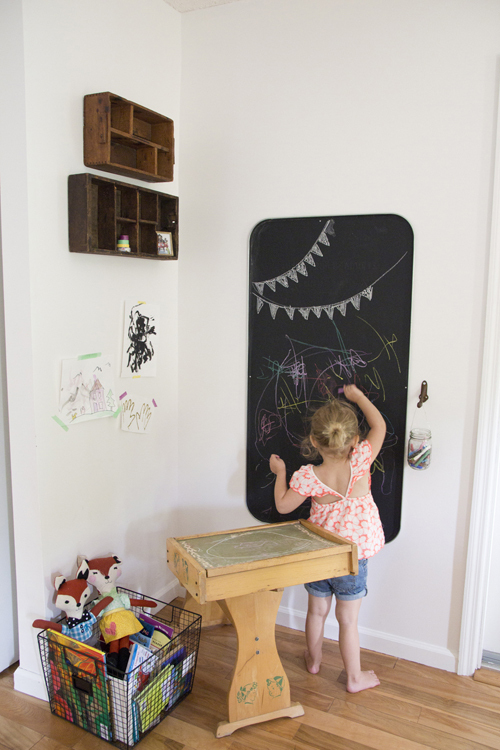 Is that chalkboard paint? Is there a how to on your blog you can point me to? 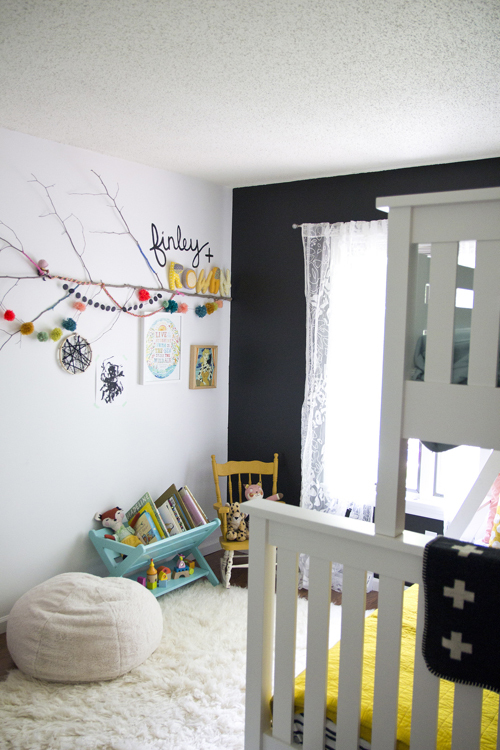 #2 Black paint in a girl’s room. What a surprise; it looks great! #3 That homemade desk unit. I’m going to try to re-create it in double desk form for 2 boys although I’m not brave enough to face the guys at Home Depot on my own. emailing to the contractor we work with now. #4 looking forward to opening your home to kids in the foster system and “loving on them.” Yes, a million times, yes. That’s the bunk bed we’re looking for! Where did you get it?????? Me too! Would love to know the source! Land of Nod, we have the same one. Love your style! Of course, we’re all about B&W images, so this sort of contemporary interior with traditional items, sentimental items, mixed in is right up our alley! 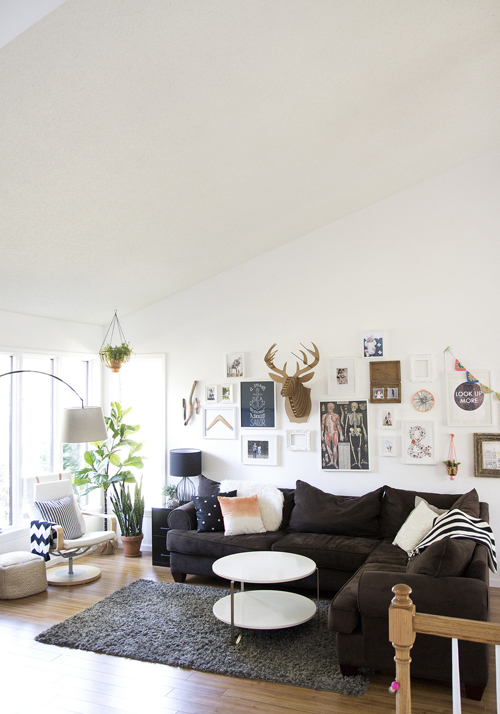 Nice decor – clean lines, cozy feel but without feeling cluttered. Thank you for sharing yet another fabulous home. Jennifer, I will be checking out your blog and hope you post more about fostering. My boys are 4 & 2 as well, and we are in the middle of our foster care classes. I am full of love and fear for the future this brings. Please keep sharing about your adventure! What a beautiful, love-filled home! 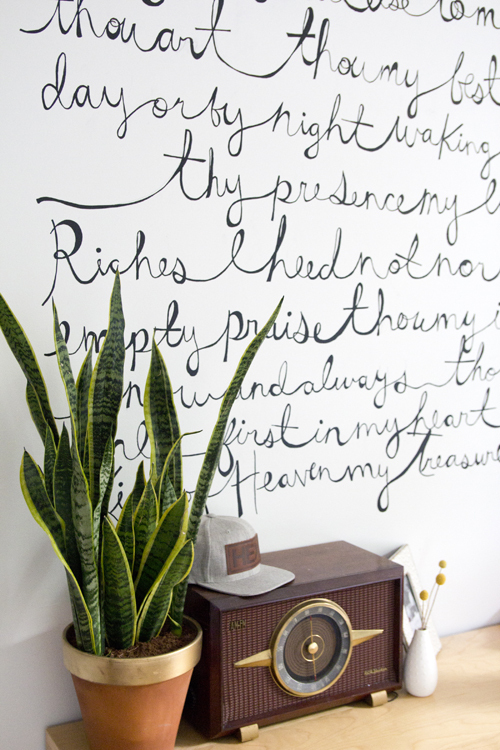 I adore the ‘Be Thou My Vision’ artwork on the wall!! Jen, did you DIY it? or is there somewhere I can buy it? The be thou my vision wall is so inspiring. And the nesring-induced office desk is so fantastic! Hey! 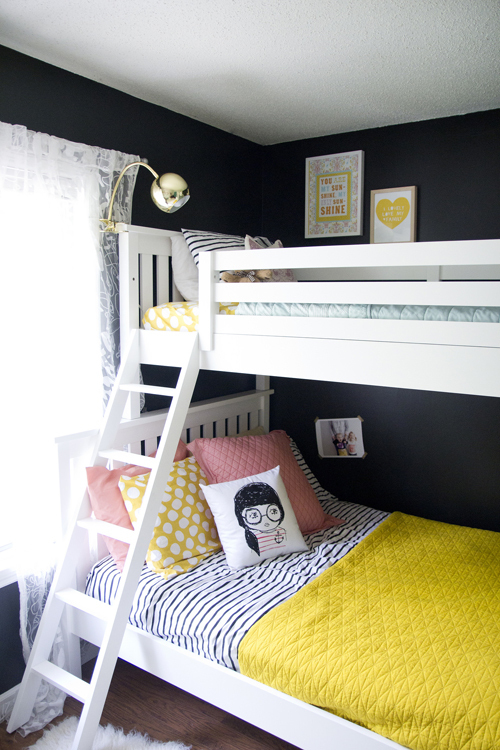 I am on the hunt for some good study white bunk beds. Where can I find this set?